It’s been a few weeks now at the Workshop without activity reports so let me get back to it with a mass of projects at hand. As I mentioned before I’m trying to get as many models painted as possible (given time) before the baby and for that I have made some progress with the existing batch as well as delve into some others. Hop in and see what I’ve been up to. It’s been a while since my last WIP post due to overseas travel and a helluva last week with work and various catch-up activities. I did find some time to spend on more models and little time to dedicate solely to painting so let’s get to the progress thus far. Another short update today as I’ve been busy preparing for next week’s business trip to the States. I’ve been naughty again and as the cover photo suggests I’m working on my Khorne Bloodthirster. This is one of the models that show you the how far the plastic injection technology has improved compared to the earlier models by GW as the detail on the model is very crisp with less and less mould lines. Once I fix the join lines with some Green Stuff I’ll prime it and get to painting straight away as I foresee this to be my last large project before the inevitable change in schedules in November. Size comparison between the two-handed axe and a Daemon Prince. This guy is huge. … and so are his wings. It will be quite fun to paint them. Sub-assemblies done. Without tack it’s difficult to hold all of them assembled with one hand! 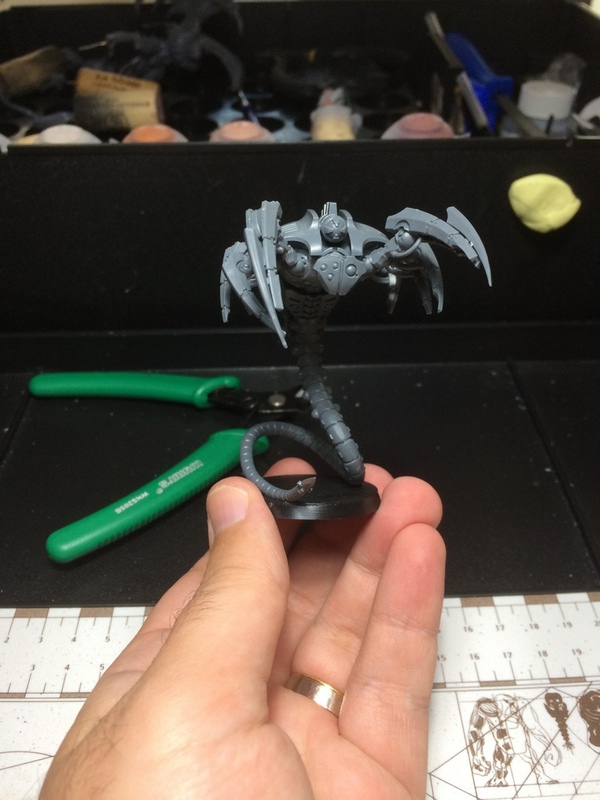 I also assembled a Necron Wraith, for fun. Might gift it at a later point. Gotta love the Canoptek models! In other news I decided that I hate the skin work on the Random Encounter mini so I decided to start anew with a base layer of Cadian Fleshtone. Hopefully I’ll be able to work with thinner glazes to get where I want to go and won’t have to strip the entire thing. That’s all for now folks, hopefully I’ll have more colors in the next update the week after. WIP Update: Week 4 of March 2015 and Happy Birthday to RW! Greetings! After a quick flight to Malaysia for business and a week filled with work I got myself to having some quality time both in the hobby department and in the company of friends. I also received the large package I ordered from Oversoul related to their recent business changes to add to my mountain of kits… what a backlog this will create! Hop in to see what I’ve been up to in my absence after the jump. We begin this week with a short update this time as I’m preparing the meatier content for Wednesday. This weekend proved to be a valuable opportunity to get a lot of hobby work done and got me really excited due to the fact that I found ample time to paint some miniatures! I know, I’m quite shocked myself. As you can see from the highlight photo I’m working on the Nurglings and am making substantial progress towards finishing the skin tones. I also branched out to try out other techniques until I can get myself a proper wet palette. Colour of the Gods has an excellent tutorial on how to use thin glazes in succession to build flawless color transitions on your models (which I used this time to some effect) so I highly recommend you check them out. Here’s a few other shots of the little rascals. First model painted, satisfactory results! In other news Ragıp Oy from FigurinIstanbul has honored me by nominating me to display 5 of my models over 5 days on Facebook as part of an “ice bucket challenge of miniatures”. 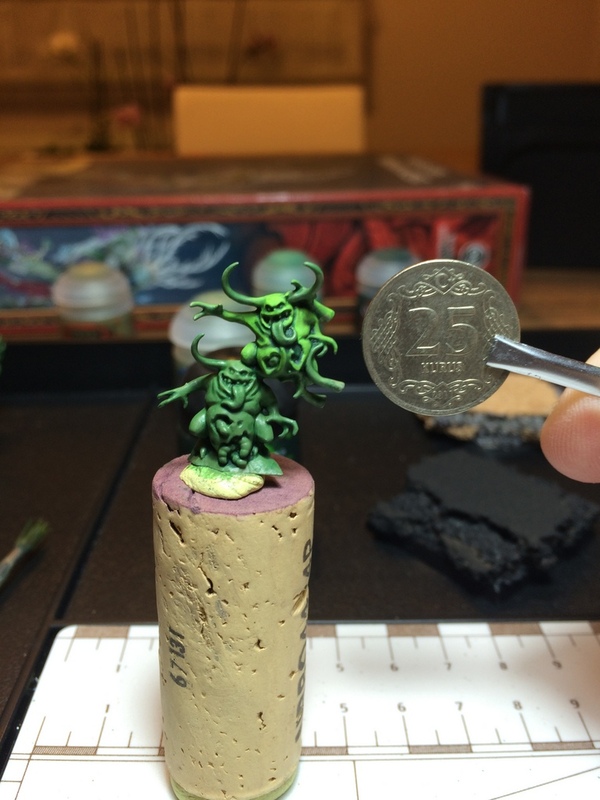 Today I’ve posted the first batch for the challenge and nominated MaGie Miniatures to show her beautifully rendered minis. Unfortunately I was waylaid by the fact that my Foldio did not work in the weekend. So, past photos of the models this time and we’ll see if I can get the photo booth to work again for later models. Lastly, I’ve decided to implement the widely accepted system of Monday miniature showcase and Wednesday WIP posts on this corner, let’s see if I can get a reasonable flow going for me. For extremely industrious weeks I may include Friday as well, but I think this routine will keep me busy enough. That said, I’ve collected a lot of WIP content for this Wednesday, thanks to the marginally clearer weather we had last week, so be sure to stay tuned for the next post. Especially if you like Space Hulk and Necrons! Hey everyone! As the post name and the highlight photo suggests I’ve made some headway with yet another kit in assemblies – this time it’s the Plaguebearers of Nurgle. I also cleaned up and assembled all Genestealers from the Space Hulk set but that will be the topic of another post, possibly Wednesday. Making good progress till I get a chance to use my primers! Take a look at what I’ve been up to. Miniature armies, huge time sink. miniatures, painting, gaming. It's mostly dwarves, mostly painted while drunk. Welcome. The adventures of a seriously casual tabletop gamer. 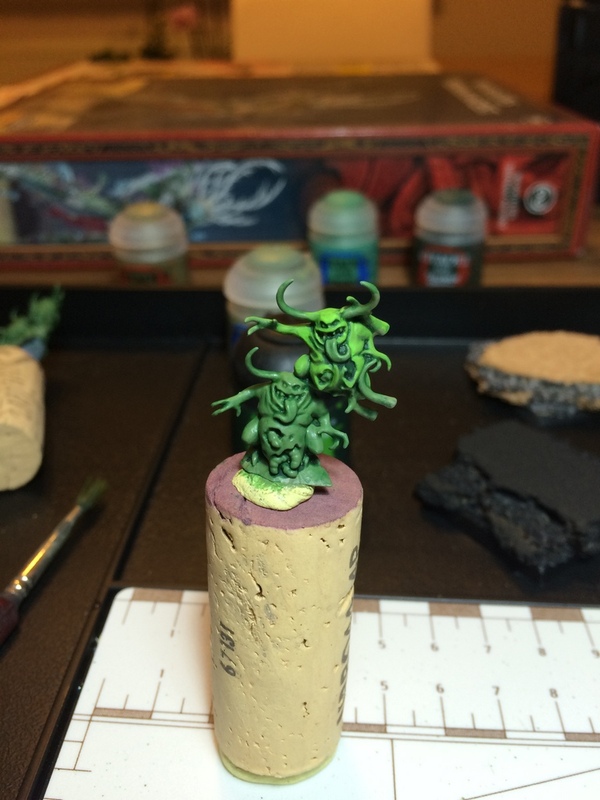 a blog about gaming, painting and modelling. A regular blog that updates every Tuesday. I'm usually writing about my favourite game Malifaux, but will also occasionally diverge into other games, films, and random musings. The ramblings of a 30-something wargamer who really should know better by now. Building & painting an Iron Hands army.